The Loheat 2000 range of water heaters was introduced 10 years ago, since when Loheat have been continuously developing these products. All these developments have been incorporated into the range of copper cylinder heaters and option packs in production now. Be assured all key dimensions, plumbing and electric locations remain unchanged. The latest evolution has been to change the casing material from plastisol treated galvanised sheet steel to a casing constructed from Aluzinc coated sheet steel that has the look of stainless steel with it's clean, natural & bright silvery surface which gives improved durability and resistance to corrosion. milkingmachines.co.uk have been selling and installing these water heaters since 1987, and have absolutely no hesitation in recommending them to you. To maintain correct water temperatures it is important to prevent entry of cold water into the heater during the cleaning process. Loheat offers several different systems for this purpose. All heaters are open topped for easy cleaning and descaling. All models in the range have a large 19 litre header tank with full size brass ball valve, inlet service valve and insulated aluminium lid. All heaters from 160-680 litres have two 28mm outlets, with an extra half capacity outlet on all models 295 litres and above. The starter model has a manually operated ball valve to prevent cold water entry when drawing off hot water. A rod thermostat controls the temperature and the analogue thermometer reads it. All heaters have a pilot light fitted on the front panel indicating power on. These water heaters are very easy to install, and are supplied with full installation instructions, although any mains electrical work should be carried out by a qualified electrician. To upgrade to a more automatic operation we offer a wide range of factory fitted options. These allow you to select the most appropriate product. our choice of options ensures you only pay for what you need. Look here for options. For current pricing just click on the button below. 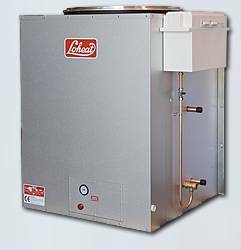 The Loheat 2000 range of Aluzinc / Stainless Steel water heaters have been introduced to bridge the price differential between traditional copper and stainless steel heaters. The Aluzinc / Stainless Steel water heaters are built to the same exacting specification as the traditional Aluzinc / Copper heaters, but are fitted with a stainless steel cylinder which gives improved durability and resistance to corrosion, especially in hard water areas, with an Aluzinc coated outer casing. You only pay for what you need with our water heaters, which are built exactly to your requirements. Look here for options. The more discerning customer, all heaters can be custom built with stainless steel tanks and casings. As the price of stainless steel is subject to wild market fluctuations, prices for these heaters are always on request. The design of the water heater is the same as the tried and tested standard dairy water heater. Please note that Standard Model water heaters feature no time clock or automation. These extra cost items are factory fitted and are available at the time of purchase. Look here for options. 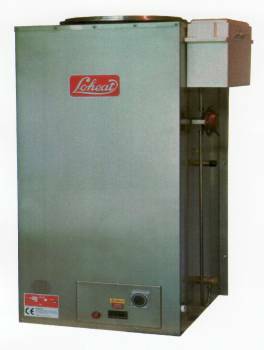 Click here to view the specifications of the Loheat range of Dairy Water Heaters. Click here for terminology and installation notes. Please read this section before making a purchase. Click here to be taken to our secure site to purchase your copper / Aluzinc Loheat Dairy Water Heater or here to purchase your stainless steel Loheat Dairy Water online. You can also phone, fax or skype your order through to us. For standard Dairy Water Heaters, we can usually supply within seven working days from receipt of order. Stainless steel water heaters are made to order, so please allow up to 3 weeks.